Epidermal Growth Factor (EGF) is a polypeptide growth factor which stimulates the proliferation of a wide range of epidermal and epithelial cells. 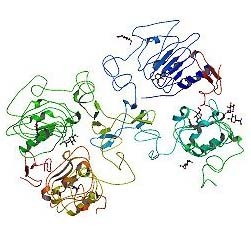 Human EGF is a 6.2 kDa protein containing 53 amino acid residues. The ED50, calculated by the dose-dependant proliferation of murine BALB/c 3T3 cells is less than 2 ng/ml, corresponding to a specific activity of 1.0 x 105 IU/ mg.
Less than 0.3ng/ug (0.3IEU/ug) determined by LAL test. >95% as determined by SDS-PAGE and SEC-HPLC. Lyophilized rHuEGF although stable at room temperature for 3 weeks, should be stored desiccated below -18oC. Upon reconstitution rHuEGF should be stored at 4oC between 2-7 days and for future use below -18oC. For long-term storage it is recommended to add a carrier protein (0.1% HSA or BSA). Aliquot to avoid repeated freeze-thaw cycles. It is recommended to reconstitute the lyophilized rHuEGF in sterile 18MΩ-cm H2O not less than 100ug/ml, which can then be further diluted to other aqueous solutions. PDB rendering based on 1ivo.